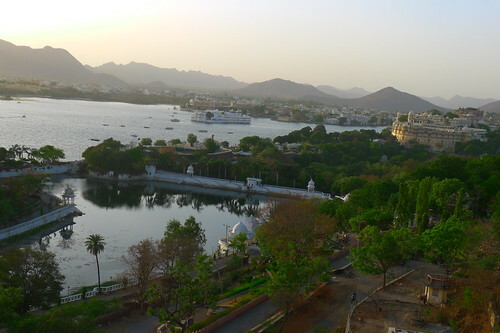 Udaipur was my favorite city to visit on my tour of Rajasthan. 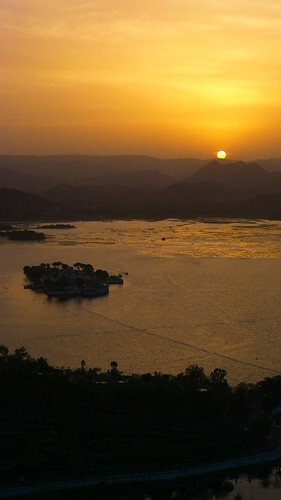 It’s gorgeous lakes and surrounding mountains make for beautiful sunsets and it’s palaces are worth exploring for a glimpse at the city’s colorful history. 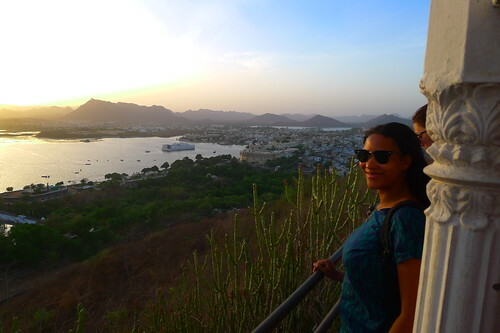 On our first evening in Udaipur we watched the sunset on Lake Pichola by accessing a hill via the Mansapurna Karni Mata Ropeway (cable car). After, the sun dipped behind the mountains we descended the hilltop and hired tuk tuks to take us to a Thali restaurant for dinner. 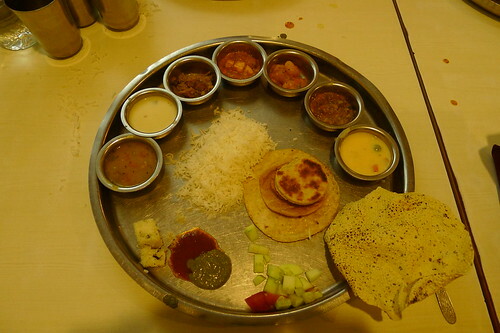 I’m a big fan of Thali because its offers a variety of things to try (rotis, daals, vegetables, rice and more) instead of having to commit to one dish. This restaurant had unlimited portions but I was pretty full after just my first round. My roommate Katy got the brilliant idea to go to a fancy spa the next day and after some research and calling around booked us at the Leela Palace Hotel spa. 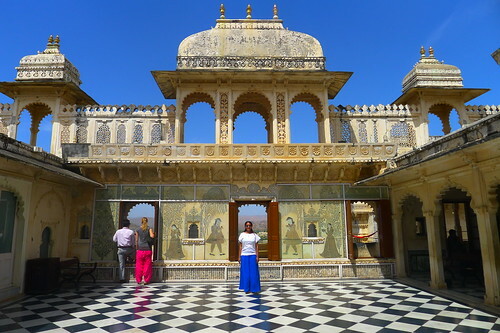 The next day we had an amazing breakfast at Govinda’s Café on the road leading to the Udaipur City Palace. 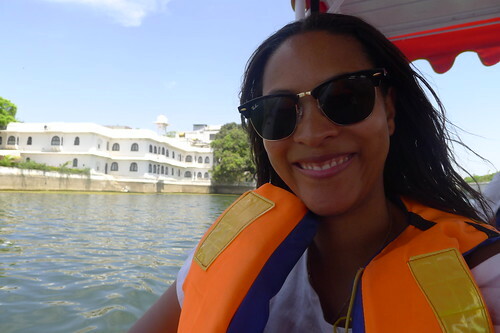 Katy and I walked through the palace following the audio tour and enjoyed a boat ride around the lake and explored one of the lakes tiny islands. Govinda’s was so good we decided to go back for lunch before heading to our spa appointment at the Leela Palace Hotel. 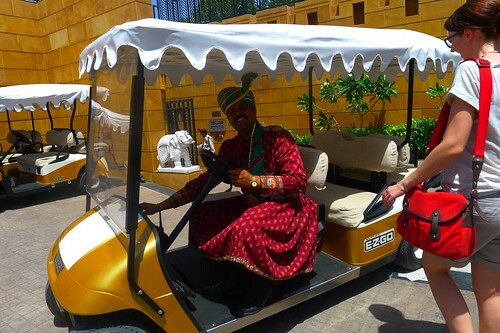 From the minute our tuk tuk dropped us off at the Leela Palace hotel I felt pampered. Since the hotel grounds are so large a buggy was sent to pick us up and take us to the spa. On arrival we had the full royal treatment with cold scented towels, complimentary drinks and our own private bungalow over looking the lake with a private infinity pool. I literally pinched myself, I couldn’t believe how wonderful my day was. Katy and I enjoyed the pool, views and lounged around before heading into the bungalow for our spa treatments. I had a body scrub, facial and massage. There was an India wedding going on at the hotel and we could hear the most amazing live Indian music wafting from across the way making the whole experience even better. I was completely blissed out after the spa and can easily say it was in the top three spa experiences I’ve ever had in my life. In the evening the group went to a cultural show t the Bagore Ki Haveli where folk dancing, puppetry and stories from Rajasthan were on proud display. 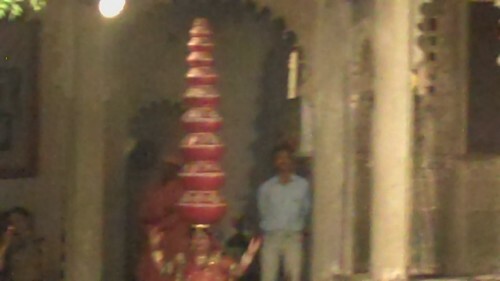 My favorite was the Bhavai Dance – a dance represents the gratification of Rajasthani women when she gets water in desert after walking so long keeping so many vessels on her head. 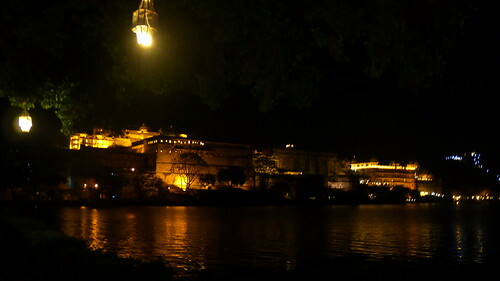 Dinner that evening was al fresco at a restaurant with a spectacular view of the Udaipur palace at night. I think it was the Ambrai Hotel or at least near there. 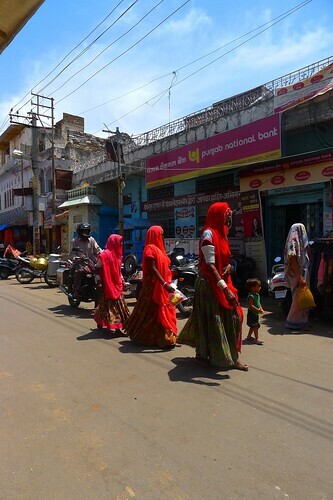 The next day we travelled to Pushkar where we spent two nights. The highlights for me were watching the sunset on the lake, having my first pizza in almost a month, and watching my first bollywood film at a rooftop restaurant. It was good for shopping as it had a market area with stalls as far as the eye could see and the prices were cheap. I mostly browsed and too picks of locals and tried to stay out of the way of the wandering cows. 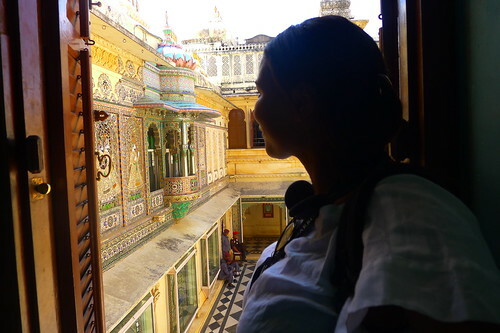 Jaipur, was our next stop, and one of the cities I had been looking forward to visiting. Dushyant arranged for us to see a bollywood film inside a beautiful Indian cinema for our first night. 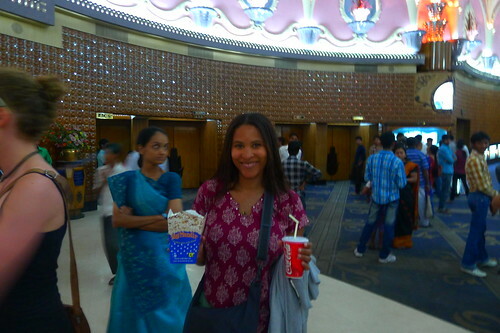 The Raj Mandir was very art deco in design and has a breathtaking lobby with high ceilings and the most affordable snack bar. Popcorn was only $.50. We saw a crazy film called House Full 2. It had several plots, good dance numbers and very hot actors. Seeing a film in an India cinema has its quirks. People were using their mobile phones, talking over the movie there was even an intermission. The next day we woke up bright and early and walked through the old town and bazar. 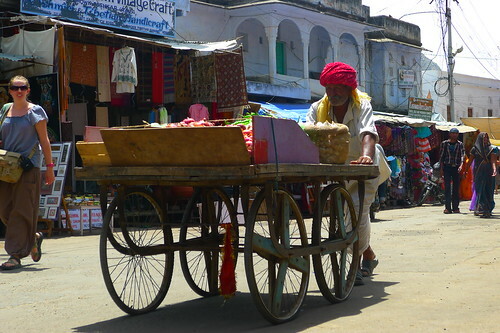 We saw daily scenes of people selling everything from spices to snacks and desserts. 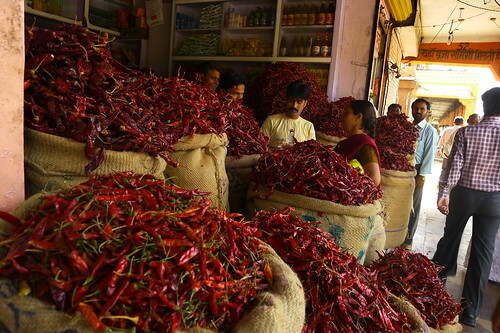 I found the aroma of the chili stalls overwhelming and sneezy. 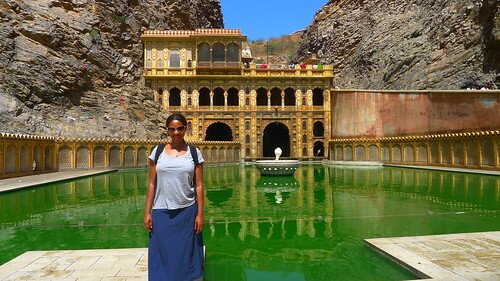 We hired tuk tuks to visit the Galwh Bagh or Monkey Temple outside of Jaipur. As you can imagine, it’s crawling with monkeys. Most were just lounging around, some were busy grooming each other. 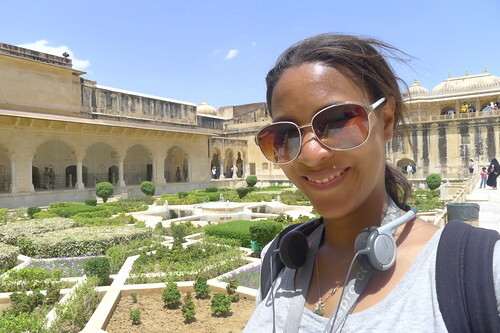 Our tuk tuks then dropped us off at the Amber Fort, royal palace of the Kachwahas from c. 1600-1727. It was crazy hot by this time of day so I fast forwarded through the audio tour and had lunch at a nearby coffee shop with Katy. Surprisingly they had really good veggie pizzas and cold smoothies. After lunch we did a little shopping for jewelry back in the old town and I picked up a few pairs of earrings. 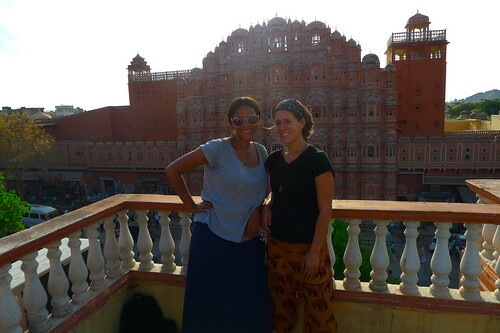 I was able to see the Hawa Mahal or Palace of the Winds just as the sun was setting behind it from the roof of a local jewelry maker I met while out and about shopping.